Showcasing the Austrian company’s 124-year heritage of creativity, innovation and craftsmanship, the unique booth is divided into four sections inspired by the elements of nature: air, water, earth and fire – all of which are integral components in Swarovski’s crystal manufacturing. Masterminded by Dutch visual storyteller Marcel van Doorn, the exhibition explores the relationship between light and darkness. The space is built from dark blue wood panels that enhance the brilliant crystal lighting pieces. 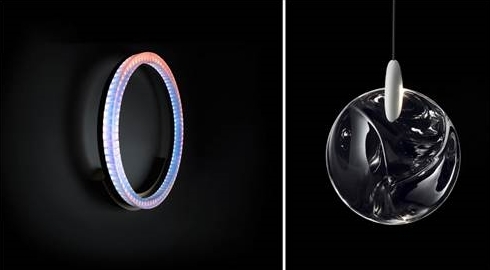 New designer collections from Swarovski Crystal Palace include new works from Tord Boontje’s ‘Luminous Reflections’ series, and ‘Cyanometer’ from Swarovski Designers of the Future winner Marjan van Aubel. ‘Luminous Reflections’ features smooth, unfaceted crystal components that are the first of their kind to be launched by Swarovski. Their highly innovative, fluid surfaces create a rippled effect that radiates soft light and replicates the shimmering reflections of sunlight on water. First introduced at the 2017 London Design Festival, an extension of the collection debuts at Euroluce, including a new pendant design in three variations and a table lamp. ‘Cyanometer’ – which comes as a floor lamp, ceiling lamp and a wall light – uses White Opal crystals in a minimalist design. The White Opal crystals collect light, as opposed to refracting it, emitting soft hues of blues, pinks and reds to mimic the 24-hour cycle of daylight. The collection will be commercially launched and exhibited for the first time at Euroluce. Swarovski’s contemporary collection embraces elevated minimalism using Swarovski crystals. New products include a collection featuring Swarovski’s iconic and exclusive ‘Vibrant’ bead crystal. Launching commercially is the ‘Infinite Aura’ collection, which combines exquisite craftsmanship, cutting-edge technology and innovative design. The collection connects to a bespoke Swarovski lighting app, allowing the user to select from five pre-set ‘auras’ and three ‘effects’, or to create their own unique lighting environment. Swarovski’s Schonbek collection, synonymous with classic designs handcrafted to the highest quality, will introduce two new authentic and traditional product families. Droplet and Florijana have a versatile application approach: chandeliers, table lamps, floor lamps, close-to-ceiling fixtures and wall sconces. At the center of the exhibition, showcasing Swarovski’s expertise in bespoke and technologically advanced lighting, is a specially designed crystal installation that climbs up the bronze mirrored wall and ceiling of the booth. The centerpiece, created from brushed gold, frosted glass and crystal, reacts to movement and pulsates like a living and breathing organism. Swarovski also offers standard and bespoke lighting solutions for public spaces, hospitality, luxurious private residences and yachts. A dedicated team of industry experts at Swarovski offer 360° support to clients, providing innovative design skills, planning and logistics expertise, and comprehensive support throughout the entire project. Manufactured at Swarovski’s historical base in Wattens, Austria, the new collections feature the most responsible crystal on the market: Swarovski’s patented Advanced Crystal formula, which enables the crystals to be lead free while retaining their superior brilliance and sparkle. A third of Swarovski’s energy for crystal production comes from renewables and 70% of the water used is met through recycled sources as part of its environmental management program. Through the company’s CLEAR program, Swarovski systematically manages, restricts and eliminates harmful chemicals from products and its supply chain. These efforts are part of Swarovski’s commitment to driving positive change in the industry.